– Building a futuristic, wildly styled concept car that is chock full of eye-popping gizmos and electronic wizardry is almost impossible to bring to market, or so you think. Visitors to the 2003 New York International auto show that drop by the Volvo display stand will have the unique opportunity to do just that when Volvo Cars of North America, LLC, shows Concept Lab Volvo, a unique computer-based interactive design experience that gives the consumer a chance to "chime in" on possible future Volvo cars. "Volvo has always cared about the people who drive our cars," commented Vic Doolan, President and CEO of Volvo Cars of North America, LLC. "With Concept Lab Volvo we are taking it to the next level. We want them to tell us how Volvo cars of the future should look. Concept Lab Volvo only reiterates what we've been saying since the launch of the XC90, 'You think, and then you build.'" A yellow sport sedan: A study that explores how dynamic a compact sedan can be. Ultra-light construction is utilized for outstanding fuel economy and many of the visible and structural and suspension parts are derived from motorcycle design. A sports coupe: A blend of retrospective shapes from earlier Volvos and a futuristic view on a compact two-seater sports car. It also includes a zero emission powertrain with a hybrid battery pack. A small SUV: Demonstrates how the expressive ruggedness and flexibility in a large SUV can come in a compact size with an efficient footprint. It allows off-road use as well as urban convenience. The load fixation system is integrated in the roof design. An "Urban Jungle Rider": An extremely compact four-wheel drive roadster with a flexible roof set-up. The glass roof may be removed, exposing the aluminum structural frame. A four-seat hatchback: Maybe the shortest Volvo ever, with extremely short front and rear over hangs. It could be a three-or five-door design. The strong shoulder section emphasizes the modern Volvo heritage combined with stunning coupe-like lines. Next to each scale model resides a touch-screen computer monitor. Visitors will be able to move through various pages, answering questions about each vehicle from design to safety features that will help Volvo Car Corporation determine how these potential future models should be brought to market. Via the www.conceptlabvolvo.com Internet site, customers throughout the world have direct contact with the heart and brains behind Volvo Cars. Visitors to the site can ask questions and put forward their views on these latest models and concept cars directly to the key persons behind current and future Volvo cars. The latest additions to the Concept Lab "range" are the Versatility Concept Car (VCC) – also to be unveiled at the New York show – and the five other small-car concept studies. Launched earlier this year, about 5,000 people have registered as members on www.conceptlabvolvo.com and more than 100,000 people have visited the site so far. Reactions to the concepts have been positive: "Ahead of the curve," "smart, intelligent, interesting," "seeing the future," are just a few of the comments people have entered in the site's evaluation poll. The results show that a majority of users found the system easy to use and thought it an excellent way to interact with the Swedish car company. But it's not just the public who are keen to take part. Experts from all corners of Volvo Car Corporation are thrilled to be part of Concept Lab Volvo, too. "As designers, we are employed to set trends. But we can’t sit in the design studio in Sweden and decide what the rest of the world should drive," commented Volvo Car Chief Designer Henrik Otto. "We need to know what people think about our ideas and our visions of the future. Concept Lab Volvo is an unfiltered pathway between the company and the individual, and the Internet gives us contact with people who don’t go to motor shows or read car magazines. Personally, I think that Concept Lab Volvo appeals to a younger audience that we have a hard time reaching through more traditional channels. And we are very keen to know what young people think about our future and visions. After all, they are the ones who are going to buy these cars." "Our concept cars are not simply one-off dreams," said Doolan. "They feed the development of our production cars. In fact, two of the concept cars previously shown became production vehicles. The Adventure Concept Car (ACC) became the XC90 – a truly outstanding success story that continues to this day. 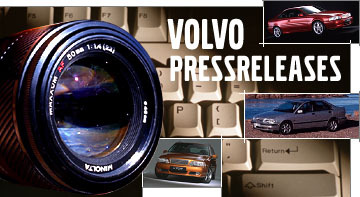 And the Performance Concept Cars (PCC1 and PCC2) turned into the exciting new S60 R and V70 R."
The site now includes detailed information about the thoughts behind the new Volvo Versatility Concept Car (VCC) – and the five other exciting concept studies from Volvo’s design studios in California, Spain and Sweden. Concept Lab Volvo is open throughout the auto show. It can be accessed from terminals on the Volvo stand, or from any computer with an Internet connection. This 16-page document in PDF format is the full Press Information Pack.